This research examined the intersection and relationship between creativity and research within creative education and postgraduate and postdoctoral research, pedagogy and policy following the establishment (and acceptance) of ‘practice-based’ art and design research within UK and international frameworks, particularly since post-1992 HE reforms, and recognition for the UK’s leading position in art and design research. 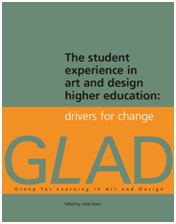 The co-authored chapter drew on contributors’ expertise as researchers and managers, and as invited delegates to a week-long event supported by GLAD, the Higher Education Academy, and the Subject Centre for Art, Design and Media to bring together 50 senior leaders from across the international art and design education community. Barfield’s specific contribution to the chapter covered analysis of research policy, particularly through his experience as a Director of Research, serving on national and international committees including the AHRC Visual Arts and Media Panel, and advising on national strategic initiatives. The publication offered a strategic contribution to policy debates and the maturation of infrastructures for creative practice research. The author’s related outcomes and activities in this field include: undertaking confidential reviews on research strategy and training for universities in Australia (2010), the UK (2012), and Hong Kong (2013); membership of the national Knowledge Exchange Reporting Working Group for Universities Scotland (2010-2011); the International Benchmarking Postgraduate Research Student Experience working group for the Scottish Higher Education Enhancement Committee (2009-2011); institutional lead on a €846k Erasmus Academic Network Lifelong Learning Programme on innovation and methodologies for artist-researchers in 3rd cycle education, involving 35 European partner institutions (2010-2011); invited speeches at the National Museum of China, and the centenary of Tsinghua University’s Academy of Art and Design (Beijing, 2011); lectures at Luxun Academy of Fine Arts, Shenyang and Central Academy of Fine Arts, Beijing (2012, 2013), and for ‘Art of the Olympians’ as part of London 2012.